1. Preliminaries Geoffrey K. Pullum and Rodney Huddleston; 2. 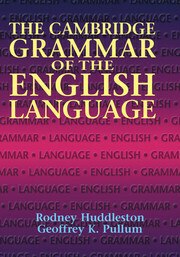 Syntactic overview Rodney Huddleston; 3. The verb Rodney Huddleston; 4. The clause, I: mainly complements Rodney Huddleston; 5. Nouns and noun phrases John Payne and Rodney Huddleston; 6. Adjectives and adverbs Geoffrey K. Pullum and Rodney Huddleston; 7. Prepositions and preposition phrases Geoffrey K. Pullum and Rodney Huddleston; 8. The clause, II: mainly adjuncts Anita Mittwoch, Rodney Huddleston and Peter Collins; 9. Negation Geoffrey K. Pullum and Rodney Huddleston; 10. Clause type and illocutionary force Rodney Huddleston; 11. Content clauses and reported speech Rodney Huddleston; 12. Relative clauses and unbounded dependencies Rodney Huddleston, Geoffrey K. Pullum and Peter G. Peterson; 13. Comparative constructions Rodney Huddleston; 14. Non-finite and verbless clauses Rodney Huddleston; 15. Coordination and supplementation Rodney Huddleston, John Payne and Peter G. Peterson; 16. Information packaging Gregory Ward, Betty Birner and Rodney Huddleston; 17. Deixis and anaphora Lesley Stirling and Rodney Huddleston; 18. Inflectional morphology and related matters F. R. Palmer, Rodney Huddleston and Geoffrey K. Pullum; 19. Lexical word-formation Laurie Bauer and Rodney Huddleston; 20. Punctuation Geoffrey Nunberg, Ted Briscoe and Rodney Huddleston; Further reading; Index.